For Chickens: Control of infectious synovitis caused by Mycoplasma synoviae, control of fowl cholera caused by Pasteurella multocida susceptible to oxytetracycline. For Chickens: Reduction of mortality due to air sacculitis (air sac infection) caused by Escherichia coli susceptible to oxytetracycline. Feed continuously for 5 days. RESIDUE WARNING: AT 200 G/TON USE LEVEL OR HIGHER, WITHDRAW 5 DAYS BEFORE SLAUGHTER. ZERO-DAY WITHDRAWAL PERIOD FOR LOWER USE LEVELS. DO NOT FEED TO TURKEYS PRODUCING EGGS FOR HUMAN CONSUMPTION. RESIDUE WARNING: AT 200 G/TON USE LEVEL OR HIGHER, WITHDRAW 5 DAYS BEFORE SLAUGHER. ZERO-DAY WITHDRAWAL PERIOD FOR LOWER USE LEVELS. DO NOT FEED TO TURKEYS PRODUCING EGGS FOR HUMAN CONSUMPTION. For Breeding Sheep: Treatment of bacterial enteritis caused by Escherichia coli and bacterial pneumonia caused by Pasteurella multocida susceptible to oxytetracycline; treatment and control of colibacillosis (bacterial enteritis) caused by Escherichia coli susceptible to neomycin. Feed continuously for 7-14 days. If symptoms persist after using for 2 or 3 days, consult a veterinarian. Treatment should continue 24 to 48 hours beyond remission of disease symptoms. For Swine: For treatment of bacterial enteritis caused by Escherichia coli and Salmonella choleraesuis and treatment of bacterial pneumonia caused by Pasteurella multocida susceptible to oxytetracycline; treatment and control of colibacillosis (bacterial enteritis) caused by Escherichia coli susceptible to neomycin. Feed continuously for 7-14 days. For Breeding Swine: For control and treatment of leptospirosis (reducing the incidence of abortion and shedding of leptospirae) caused by Leptospira pomona susceptible to oxytetracycline. Feed continuously for not more than 14 days. For Calves (up to 250 lbs. ): Treatment of bacterial enteritis caused by Escherichia coli susceptible to oxytetracycline; treatment and control of colibacillosis (bacterial enteritis) caused by Escherichia coli susceptible to neomycin. 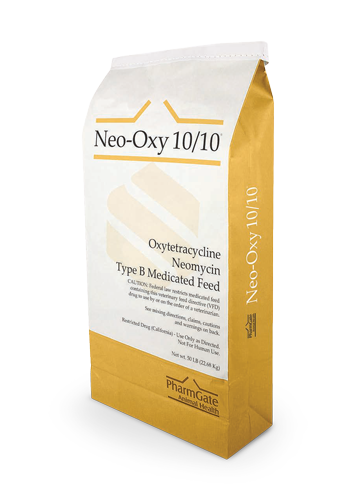 Feed continuously for 7 to 14 days in starter feed. If symptoms persist after using for 2 or 3 days, consult a veterinarian. Treatment should continue 24 to 48 hours beyond remission of disease symptoms. For Growing Cattle (over 400lbs. ): Reduction of the incidence of liver abscesses. Feed continuously. For Growing Cattle (over 400 lbs. ): For prevention and treatment of the early stages of shipping fever complex. Feed 3-5 days before and after arrival in feedlots. For Growing Cattle (over 400 lbs. ): For treatment of bacterial enteritis caused by Escherichia coli and bacterial pneumonia (shipping fever complex) caused by Pasteurella multocida susceptible to oxytetracycline; treatment and control of colibacillosis acterial enteritis) caused by Escherichia coli susceptible to neomycin. Feed continuously for 7-14 days in feed. If symptoms persist after using in feed for 2 or 3 days, consult a veterinarian. Treatment should continue 24 to 48 hours beyond remission of disease symptoms. Ingredients: Oxytetracycline dihydrate, neomycin sulfate, calcium carbonate, roughage products, magnesium-mica, mineral oil. Type B Medicated Article for use in the manufacture of medicated dry feeds (not for use in liquid feeds). Category II drug; does not require a feedmill license. n CAUTION: Federal law restricts medicated feed containing this veterinary feed directive (VFD) drug to use by or on the order of a licensed veterinarian. Category II drug; does not require a feedmill license.